As a Mom of four I don’t have a favorite child. But if I did, this yarn would be it. Please note that this is the same yarn that was previously named “Angel Sock.” I changed the name because, as one knitter pointed out, this is an incredibly luxurious yarn for shawls, scarves, sweaters, and hats, not a basic, hardworking sock yarn. You might, perhaps, use it for bed socks, particularly if you are a princess. 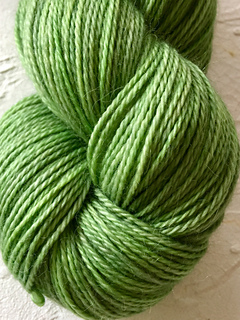 Other than that, this is the yarn of your dreams for something soft, lovely, and lightweight. The ultimate luxury yarn! My favorite cardigan is knit from this yarn in the Dido colorway.